At the stroke of midnight, Keolis Commuter Services officially began operating the Massachusetts Bay Transportation Authority's 14 commuter rail lines with a pledge to increase on-time performance and improve safety, cleanliness and customer service. In January 2014, Keolis Commuter Services, part of Keolis North America, won a highly competitive bid for the $2.6 billion, eight-year contract to operate and maintain MBTA's commuter rail service, which is the fifth busiest in the nation, serving 127,000 passengers daily. 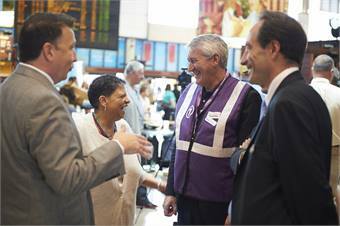 MBTA CEO/GM Beverly Scott pictured with Eric Asselin, executive VP/GM for Keolis North America to her left. 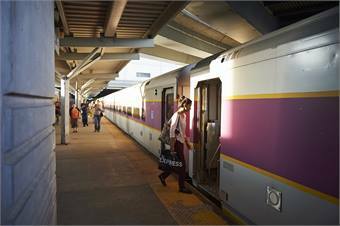 Keolis officials said passengers will begin to see changes designed to improve their travel experience almost immediately, among them the launch of a staffed customer service center that will be open seven days a week to provide assistance to customers. Passengers will also be encouraged to share suggestions or concerns via a dedicated customer service Twitter account @MBTA_CR and on Facebook. Other improvements will include freshly cleaned trains and stations, new signage, and repairs to damaged seats. 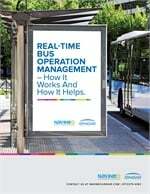 New pocket timetables, featuring larger, easier-to-read system maps, are distributing today at the major stations. Keolis will also be introducing the first official MBTA Commuter Rail app which is designed to make it easier for passengers to plan their journey. The first version of the app was released today and is free and available for download for both Apple and Android devices. An enhanced version will be released this fall, providing real-time information about commuter rail travel times, a place to register lost or found items in trains and stations and other features designed to enhance the passenger experience.